Todd Merrill Studio is pleased to offer to our clients a broad range of customization and restoration services. We have sourced the finest craftsmen in America who can customize or restore any piece of furniture or lighting. Mirror or metal work, lacquering, gilding, wood refinishing and upholstery can all be redone according to the highest standards and your specifications. When clients purchase vintage pieces from Todd Merrill Studio but require additional examples, whether that be having a greater number of dining chairs, having a twin sofa or turning a single club chair into a pair, our expert craftsman can realize any project. 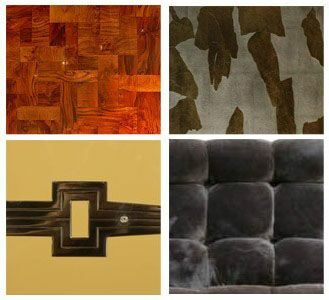 We have a multitude of sources for the finest fabrics and can offer exceptional upholstery options for our clients. With nearly a decade of experience, clients and decorators trust Todd Merrill Studio to customize, restore and modify major pieces of the finest 20th Century furniture. For a free consultation please contact us via email or call (212) 673 0531.